Number 84 West Bow, down near the bottom of the not-so-sunny side of picturesque Victoria Street in Edinburgh's Old Town, is an unassuming address amongst the majesty of this UNESCO World Heritage Site. In fact, you might stroll past its jet-black façade and not give it a second glance... people do, on occasion, although often this may have something to do with them making hurrieldy towards (or retreating biliously from) the notorious Grassmarket and Cowgate, with their plethora of purgatorious pubs. Those taking in the environs at a more leisurely pace may find the premises engenders a frisson of shock or indeed alarm, contrasting somewhat with the picturesque and perjink boutiques and eateries for which the street is perhaps better-known. Still others, their gaze wandering up from the Grassmarket as they take in the view from the vantage-point of Victoria Terrace, may behold its gold-lettered frontage as a sign that the murky world of the "Lower Town" is creeping inexorably upwards, baring gleaming (if yellowed) teeth towards those more respectable climes beyond. Or maybe they'll just trip over our sandwich-board outside, mutter a profanity or three, and make a rude gesture in the window. For this is where we hang our ostentatious, water-proof hats; the home of all that is darkly delicious in the Old Town. Open on average three-hundred and sixty-three and a quarter days per year, from mid-morning to late evening, "Witchery Towers" (as we keep hearing people outside calling it for some reason) is the shredded-nerve centre of our walking tour operation. It is also, however, an Arcadia of awesome objets d'art! We've always had some goodies to offer alongside the tours, but in our early years this was limited to our own publishing output, available by mail-order. 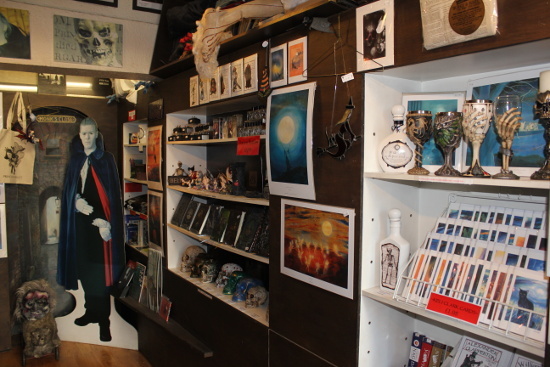 Then, in 2003, we found ourselves with a whole real-world shop and wondering what on earth to fill it with. ...but please don't gob in the goblets! We spitballed some ideastorms, ran a few things up the flagpole, then realised we didn't have a clue what any of that meant and just had a bit of a think. Then the Mad Monk pointed out: You know what everyone needs? A pen! Unable to disagree, we set about finding the very best pens in the land. Spooky pens, naturally. That was only the beginning. 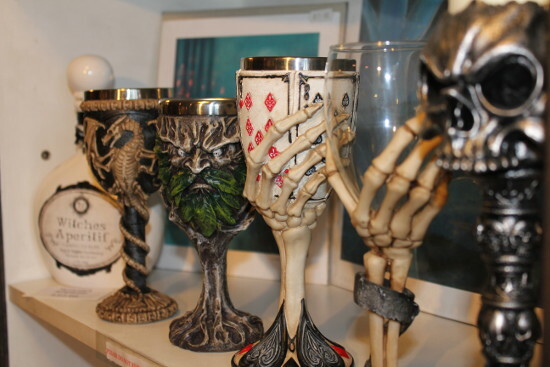 In the shop today, you can find a cornucopia (we don't use the word lightly; we looked it up and everything) of ghoulish and fantastical stationery, drinkware, ornaments, soft furnishings, original artwork and art prints, greeting cards, chess sets, and unique oddities hard to even describe. 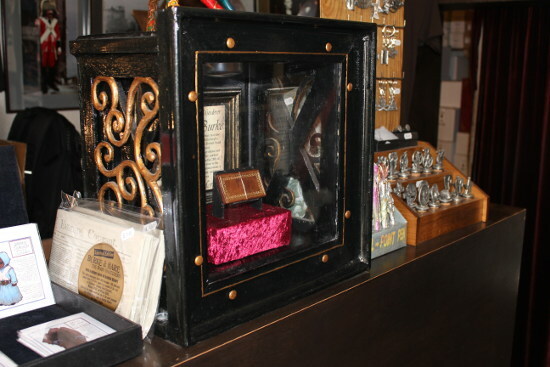 In 2015 we also became (possibly) Scotland's smallest museum, when the shop became host to a calling-card case made from the skin of the notorious 19th-century "body-snatcher" (actually murderer), William Burke. We can't sell you that (mainly because even the experts on Antiques Roadshow couldn't give us a valuation of it) but we have produced a rather spiffing souvenir newspaper taken from our own vaults and covering Burke & Hare's trial in some detail. 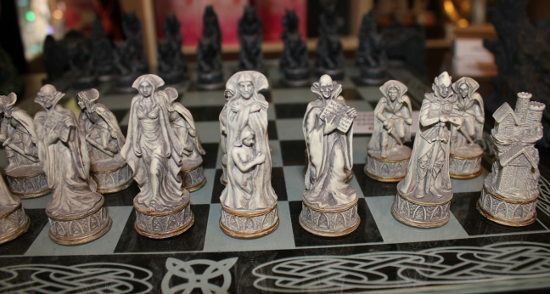 Vampires take on Werewolves at chess: cue furious internet debate. There's too much, in fact, to even list everything in our bulging online shop, so to see everything we offer ... you'll just have to pay us a visit. 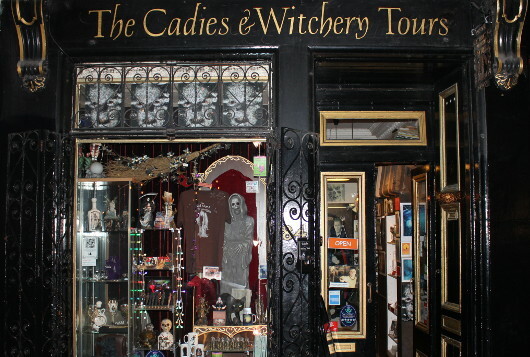 It's a familiar site in Edinburgh's West Bow to see visitors (and some locals) standing in front of our wee shop staring at the name above the door: The Cadies & Witchery Tours. Within seconds of spying our name, the front door creaks open and we prepare ourselves for the expected question: "What in the world is a Cadie?" One does sometimes see some curious sights in the hideous heart of Edinburgh's Old Town, but this might just take the biscuit.